The Walking Dead returns in a big way, as the season-premiere episode, First Time Again, is quite complex. It’s 90 minutes of non-linear moving parts that use stark black-and-white flashbacks to give meaning to the story’s current events (which are portrayed in true color). Both sides of the Alexandria community have joined forces for a super-organized attack plan to keep their gated community safe. And in classic Walking Dead fashion, those plans inevitably get scrapped and Rick’s Gang must improvise. Thousands of walkers fill a nearby rock quarry, keeping them out of Alexandria, but when the barriers fall and the Zombie horde is unleashed, everyone must be on their A-game in order to survive. New characters are introduced: Heath, Scott and Annie move into Alexandria, which has a new population of 14 people. Daryl prefers to keep hunting for new people, despite Rick’s pleas. 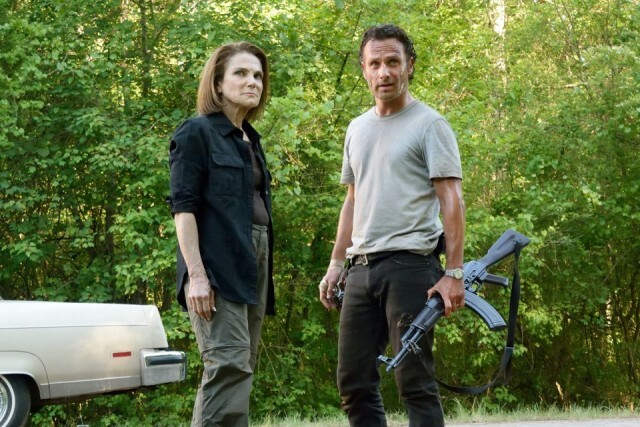 Carol stays in camp in order to help get a grip on everyone’s opinions, while Glenn and Maggie try to reveal Nicholas’ true motives, hoping to get him exiled. On top of all that, a mutiny is organized against Rick. Flashing forward and backward like LOST (which feels out of place in this franchise): Deanna puts Father Gabriel in his place, Abraham’s drinking on the job, Daryl’s back on a motorcycle (which seems to run, unlike the last one), Tara is bedridden and delirious, Glenn’s been hit by ricochet, Enid likes to play with fire, while Morgan and Deanna admit that Rick was right after all. As tensions build, a character is killed off. Rick reveals the people of Alexandria have only lived, never actually having to survive and an unplanned horn may bring the end of the world crashing into its community. As a season-premiere episode, this one had some of everything in it. From the lingering creepy intro focusing on the never-ending Zombie horde (Greg Nicotero revealed on Talking Dead there were 1,000 walkers used throughout this episode – the biggest one yet), you could tell this story would be epic. However, yet another rock quarry was used, which felt like lazy storytelling. Not every main character had a lot to do here, but surely that will change throughout the season. One element of the story that could get really old quickly is Jesse scolding Rick not to touch or teach her son, Ron, about guns and survival skills. Cue the eye rolls. Surely, this relationship won’t work. Negan hasn’t been introduced yet, so it’s unclear if that character will portray the main antagonist for the season or if the Wolves will take that role. Hopefully, neither group of evil characters will feel rushed into (and subsequently out of) the season. Strength: Many great action scenes are used to move the story along. Weakness: No more flashbacks, please. They don’t fit here. WTF Moment: Eugene compares maneuvering the walker herd to shooting an 8 ball into the corner pocket.